Our family summer vacation also included four days in Belgium. Can you tell we are smirking a bit in this photo? We are in front of Brussels very famous "manneken pis." 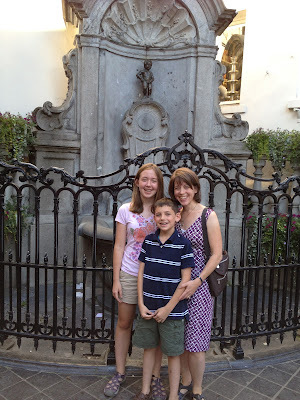 A very small statue/fountain of a boy peeing. Did I mention he is very famous? 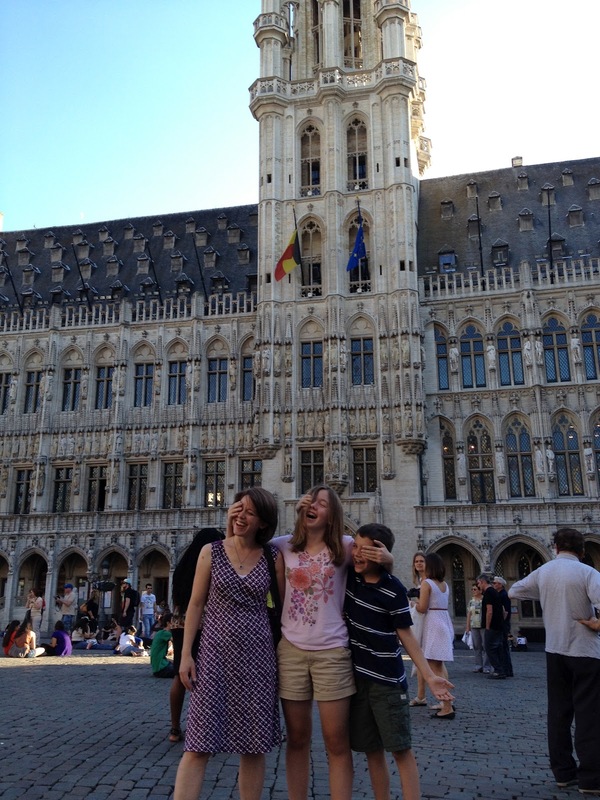 I have no idea what inspired this silliness in the beautiful Grand Place in the center of Brussels. I wish I would have taken a 360 degree video at this site. It's a city square surrounded on all four sides by stunning huge stately buildings -- and lots of people and shops. In fact, it's a good meeting place. 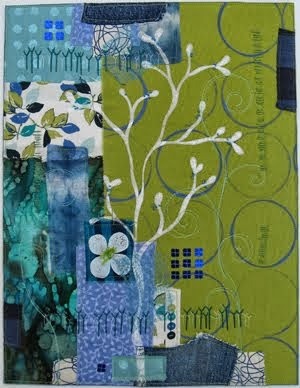 Here's Francoise Jamart, one of the other Twelve by Twelve artists. She lives in Belgium and it was so exciting to meet each other. 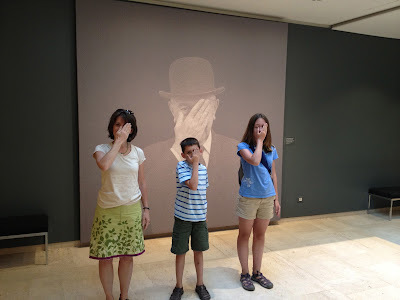 I loved the Musee Magritte... me and the kids imitating Magritte. 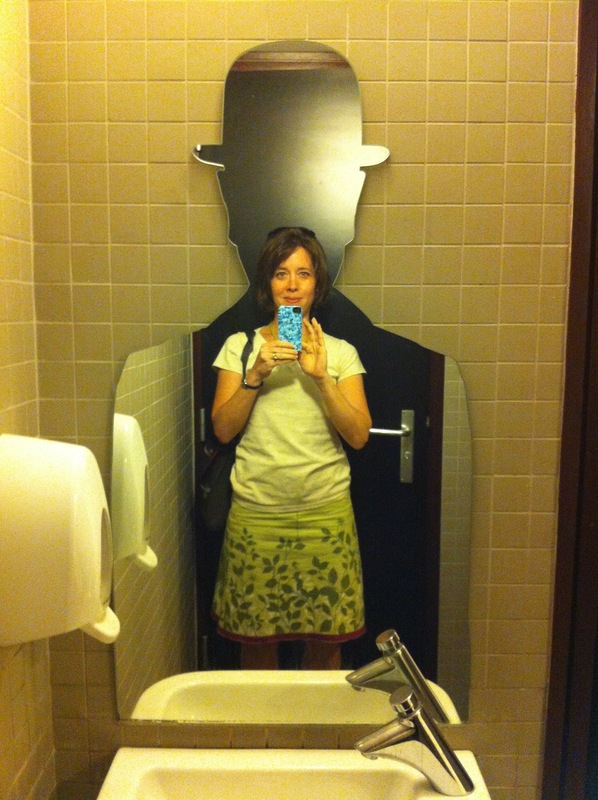 Notice he is wearing his famous bowler hat. Beautiful gardens and pathways throughout the city. 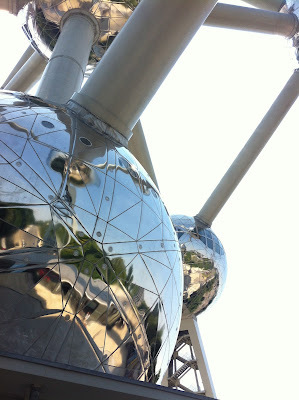 Jeff has been to Belgium a couple of times and told the kids about the Atomium, so we had to visit! It was built for the World's Fair in 1958 and is based on the design of an iron crystal magnified 165 billion times. There are actually escalators in those connecting tubes and various exhibits in each of the spheres. 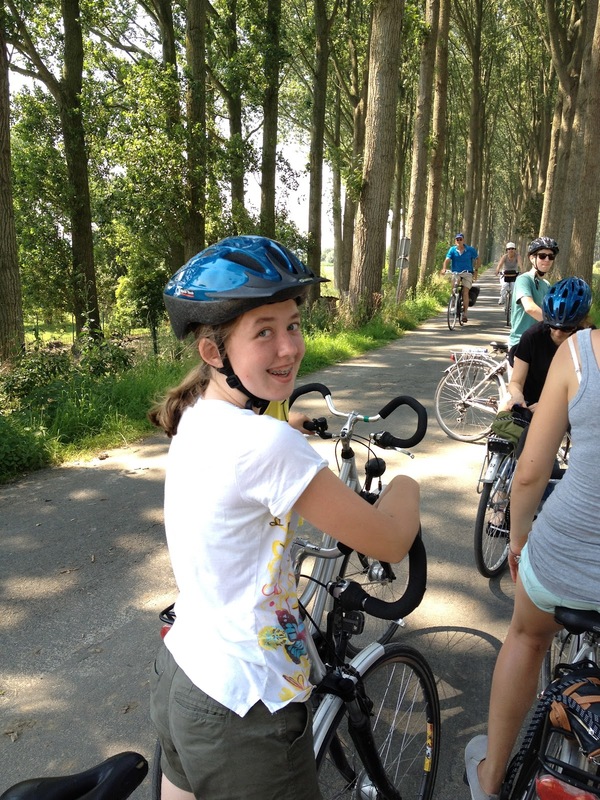 One of the best things we did on our whole trip was a bike tour in the country side outside of Brugge. 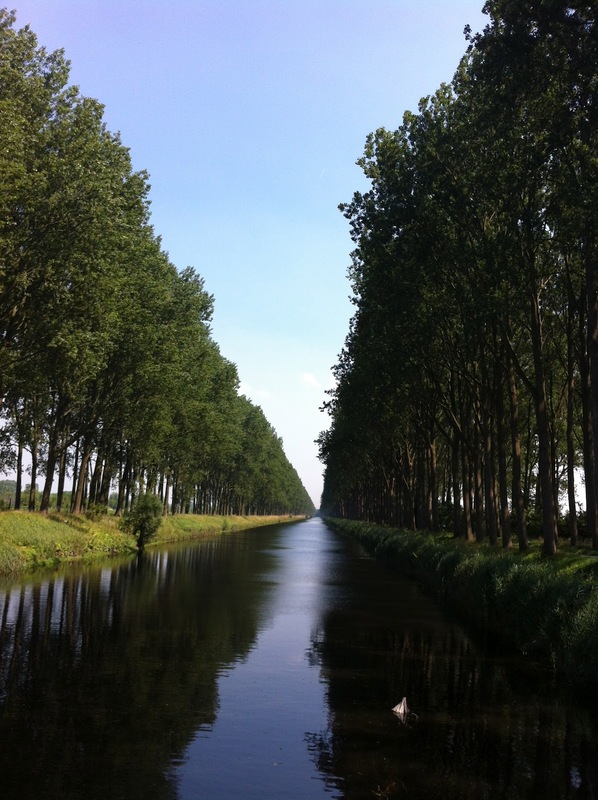 Our guide specifically stopped along the canal to point out the dramatic row of poplars and the sound of the wind through the trees. I was immediately reminded of this painting by Rene Magritte which we had just seen the day before. It's called le seize septembre, translated The September Sixteen. 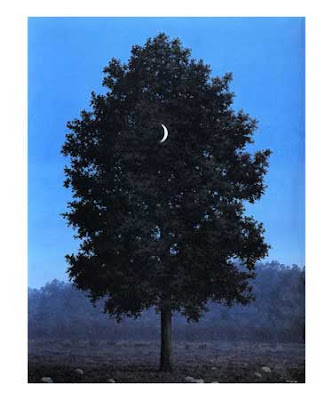 I could imagine Magritte growing up in Belgium surrounded by these trees and repeating them in his work again and again. It was one of those moments when actually experiencing a place really made a connection with other personal experiences. We biked with a small group of about 12. 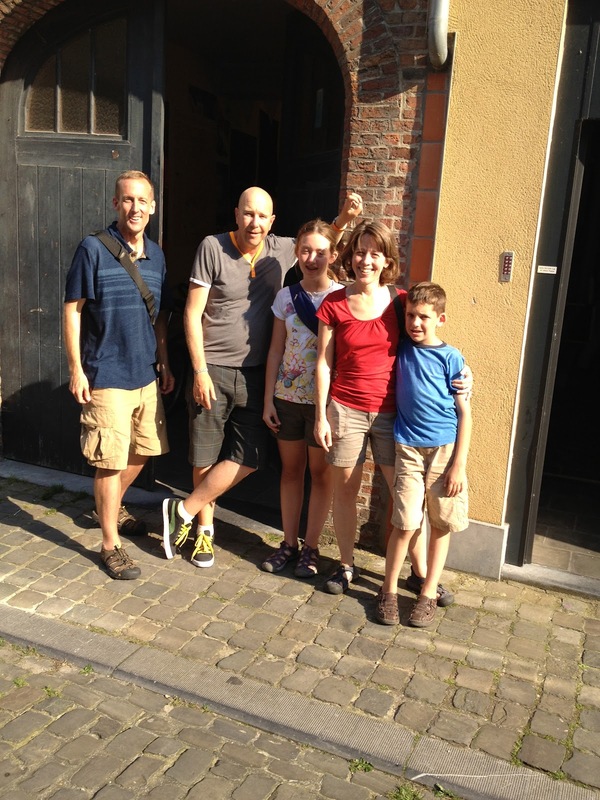 Here we are with our guide, Jos. If you're ever in Belgium, I highly recommend Quasimundo bike tours. The tour was 19 miles over about 4 and a half hours. 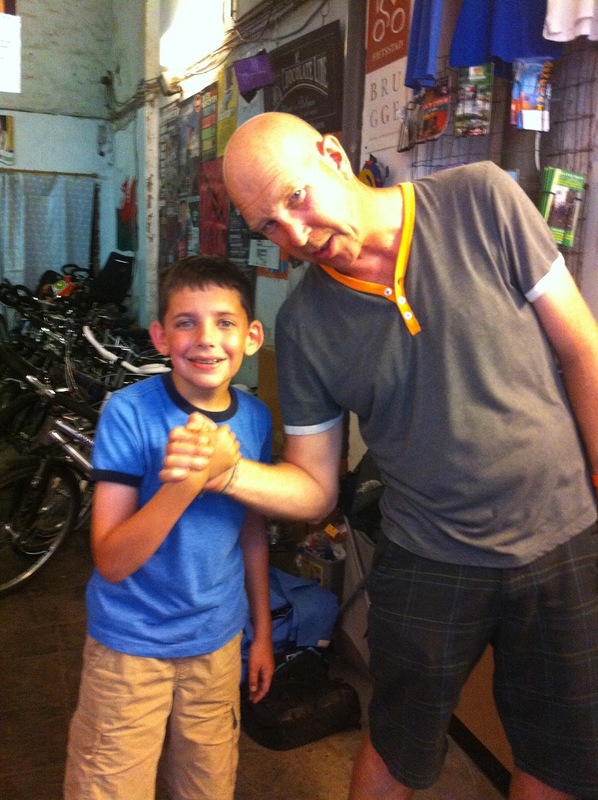 Jos was especially impressed that Benjamin rode so well and had such a great attitude. 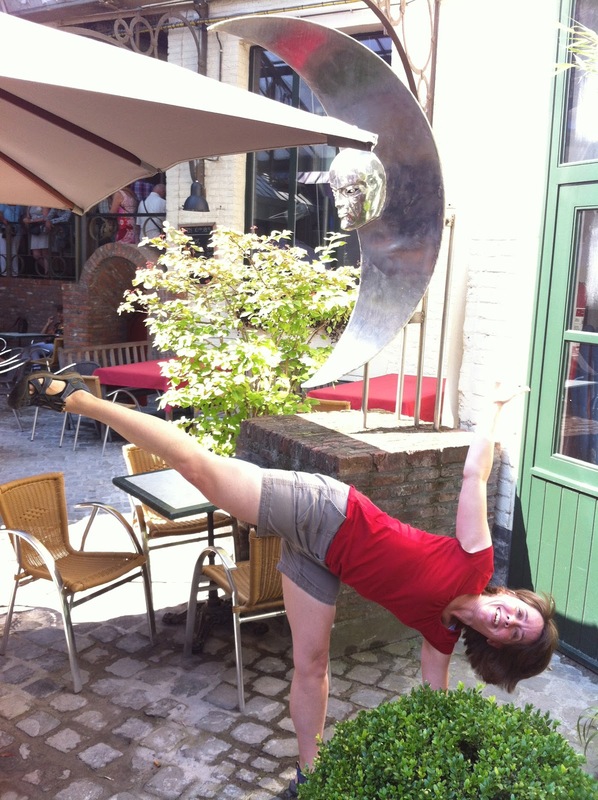 My friend Jane LaFazio likes to do "yoga poses in public places." Sometimes I join in... especially if I can find a location to match the pose. So here is the half moon post at the Half Moon Brewery in Brugge in front of their cool moon sculpture. When we got home, I asked both kids -- separately -- what their favorite part of the trip was, and they both answered, "picking out chocolates and filling up a box at Neuhaus." If I'd only realized at the moment that this was the highlight, I would have taken many more pictures. There were two delightful, patient, knowledgeable men behind the counter who carefully described each and every chocolate so the kids could decide if they wanted to include it in their collections. I think we still have a few pieces left. 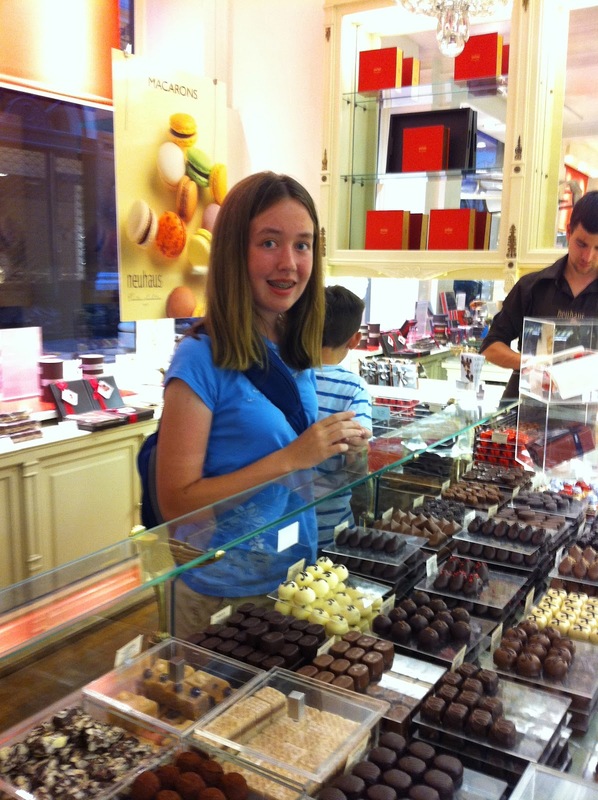 We've all been savoring them -- along with the memories of the trip. 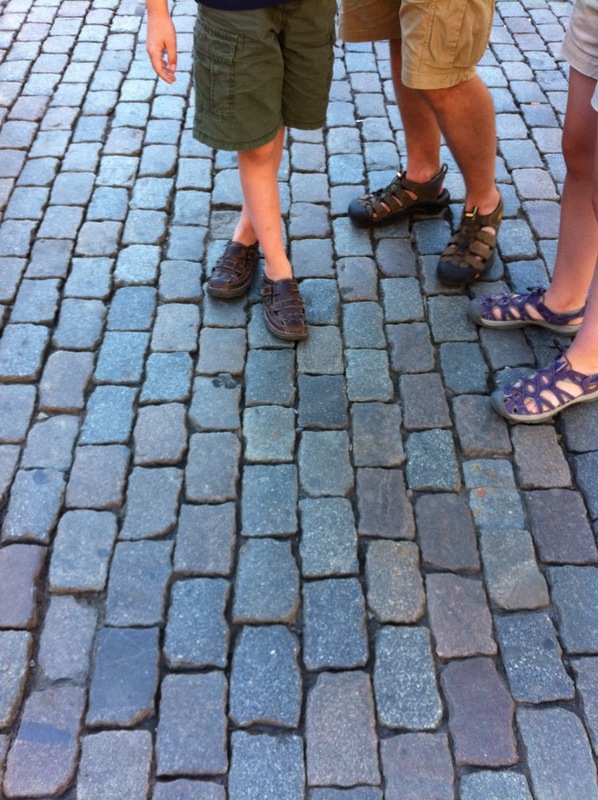 Oh my gosh, every post about your trip just gets better! Totally worth all those unsuccessful trips to the airports in the beginning. THat iron model is SO COOOL! 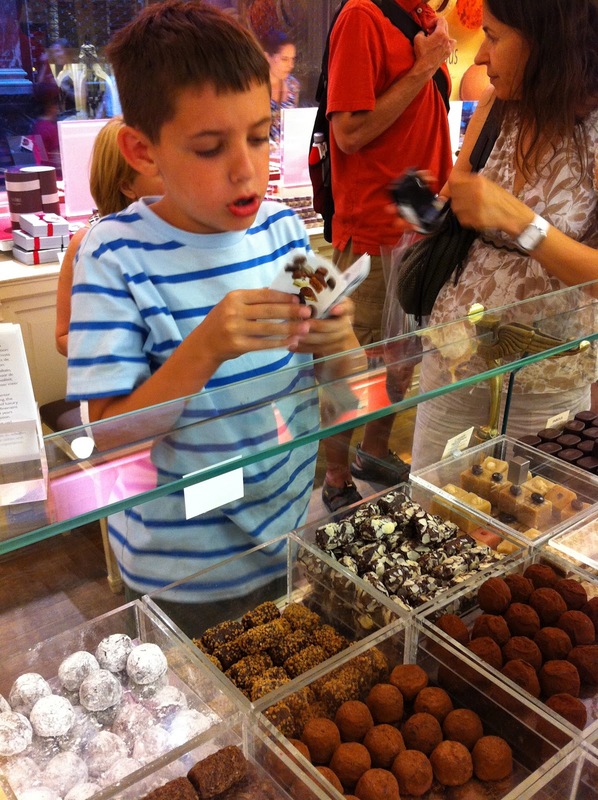 And bravo for saving those chocolates - what will power!! !